And out of the blue comes the best martial arts film in about a decade (by my reckoning Kiss of the Dragon was better, but far more commercial and expected) from, of all places, Indonesia. For the record there won’t be too much discussion of plot here, for there isn’t much of one, but it has been a long time since I felt energised by an action film and reminded of Jackie Chan’s best work. On this particular steamy morning (I have been to Jakarta many times – it is always 30 degrees and humid) a heavily armed assault group numbering around twenty are planning an all out assault. Once inside they quickly discover that this will be no walk in the park, the JaCarter is heavily guarded with lookouts, snipers and monitored on closed circuit TV. If all that and the absence of a welcome mat weren’t enough, the building is also chock full of Tama’s men, those unaligned but sympathetic to his cause, and a bunch of bad guys that just hate cops. All will take their turns at setting to the intruders. After the initial incursion – which doesn’t go well – it becomes less a raid than a room by room eradication, and strangely enough this is when things get real good. With precious few police remaining the survivors are torn between continuing upward toward Tama’s floor and almost certain death, or attempting to evade the net and work downwards to the exits and almost certain death. When they’re not shooting it out, they’re fighting hand to hand, when the store of faceless minions runs temporarily dry they’re catching their breath, usually before running, shooting and fighting again. And again. 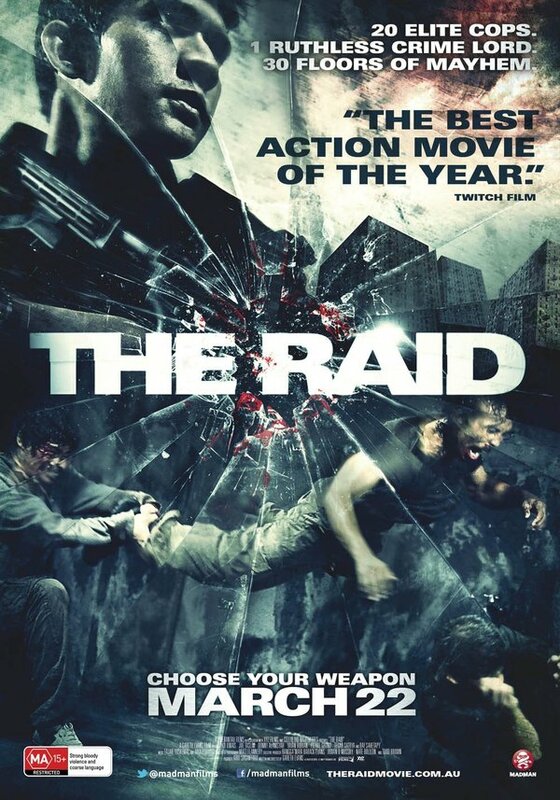 The undisputed star of the show is Rama (Iko Uwais) – though we should have guessed when an earlier scene showed him kissing his pregnant wife goodbye – the Raid: Redemption would kick much arse without him, but it kicks that much more with him. It helps proceedings that the film plays out like a video game. Hordes of heavily armed fanatics approach in single file, platformer style, with Rama taking them down with various combos, before the occasional level boss comes up to provide an extra challenge. Rama does a lot of cardio. Once this man is dispatched there is a couple of minutes to rest up and patch up – they call it plot advancement, I call it ‘loading time’ – before a new group attack. The best of these level bosses by far is Mad Dog, Tama’s vicious right hand man, Tama calmly places his loaded gun to one side in favour of life or death hand to hand combat. It serves as no spoiler that Mad Dog bites it, but rest assured he doesn’t go down easy, and the remainder of the film feels like a letdown by comparison. The action sequences are plentiful. Violent and visceral, they will have any action fan’s blood pumping and cheeks sore from grinning. It wasn’t until I watched this film that I realised how long it has been since a truly great action film has been released. Uwais might not be the athletic equal of Tony Jaa, but his fight sequences are better and this film stands head and shoulders above anything Tony has featured in by far (though the spiral staircase fight from The Protector remains a standout). Part Tony Jaa, part Oh Dae-Su from Oldboy (the film boasts a few corridor fights that are the equal to the famed Oldboy scene), Iko Uwais has announced himself as an action star from out of nowhere. 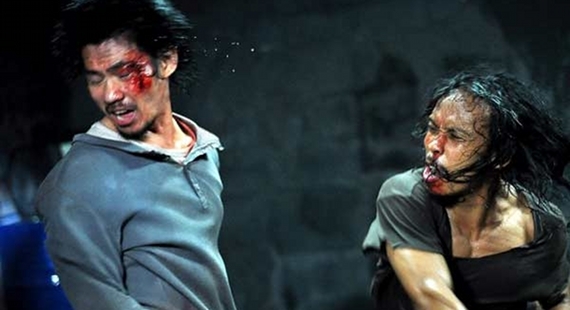 The Raid: Redemption is pure action nonsense. Brilliant, beautiful action nonsense. Final Rating – 8.5 / 10. For those budding Dalai Lamas who feel that mindless action violence is not the answer, I point to films like these and ask why not?